Multi Pad Drilling Market size for 2015 was valued over USD 90 billion and is forecast to grow over 15% CAGR by 2024. Increasing exploration and production of unconventional resources including shale and tight gas coupled with rising rig count will drive the global multi pad drilling market size over the forecast timeframe. Major countries accounting for E&P are Mexico, Russia, U.S., Canada, Brazil, Saudi Arabia, China and UAE. As of 2015, average wells drilled per rig was approximately one in the Eagle Ford region (U.S.), but till the onset of 2016, the well count reached to 5 wells per rig. Stringent government regulations including Environmental Protection Act 1994 to ensure the environment protection will stimulate the multi pad drilling market share by 2024. The technology features to reduce the well drilling & infrastructure cost, enhance productivity and minimize environmental impact, which may further complement the industry outlook. For instance, 10 wells per pad walking rig can save up to 35.8% of the drilling cost for each well, similarly a typical 4 wells per pad skidding rig can save up to 26.4% of the drilling cost. Increasing demand to produce O&G at minimum cost with less turnaround time will positively encourage the multi pad drilling market size. For instance, In Chesapeake Energy’s Powder River Basin Project cost reduced by 45% since 2014 i.e. USD 4.5 million to USD 2.6 million. A single rig with a 10 well pad, on an average can save total time of 19.6 wells/year. Growing crude oil demand along with rapid industrialization will further complement the business growth. Offshore multi pad drilling market size for 2015 was valued over USD 850 million and is set to witness strong growth owing to increasing capital investment and availability of resources in offshore locations. Volatile crude oil price along with geopolitical instability may hamper the business growth. Onshore multi pad drilling market share is predicted to witness growth over 15% from 2016 to 2024. Ongoing projects with huge untapped potential will positively encourage the industry growth over the forecast timeline. In 2017, Nobal Energy announced to invest USD 1.8 billion in onshore and USD 625 million in offshore area of the U.S. The company is mainly focusing in Eagle ford, DJ Basin and Delaware Basin for drilling and completion. Global multi pad drilling market share from < 6 pad size is predicted to witness growth over 13% by 2024. It’s less technical supervision requirement, easy operability features will positively influence the industry growth. In 2017, Antero is also planning to drill average six well per pad in Utica Shale. 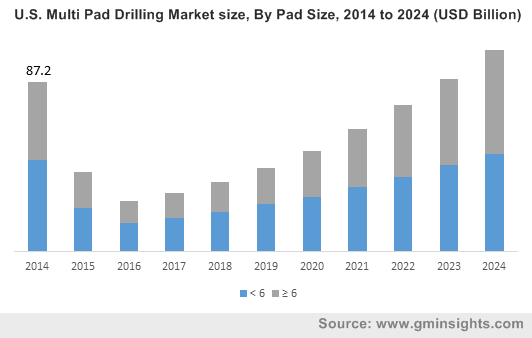 Multi pad drilling market size from ≥ 6 pad size is set to exceed USD 90 billion by 2024. Increasing investment in upstream sectors will propel the business growth. In 2017, the EQT is announced to drill 76 wells in Pennsylvania and 43 wells in West Virginia with an average lateral length of 7,000 feet by utilizing multi pad technology. U.S. multi pad drilling market size is set to witness substantiate growth on account of increasing shale gas exploration and production. High capital spending in O&G project may positively influence the industry growth. Middle East multi pad drilling market share is predicted to witness growth over 7% by 2024. Rising spending on oil infrastructure to maintain production capacity and to fulfill capacity expansion targets may favor the regional industry growth. Increasing drilling in offshore area will augment the Russia multi pad drilling market share from 2016 to 2024. In 2016, Rosneft entered in agreement with Indonesia’s Pertamina and began offshore operations in the Sea of Okhotsk with Statoil. High investment in gas field development project will further complement the industry growth. In 2016, DEA will invest over USD 1.25 billion to develop Davlin’s natural gas field in Norway. China multi pad drilling market share is expected to witness strong growth over the forecast timeline owing to abundant availability of shale gas resource. In 2016, China holds 130 BCM recoverable shale gas reserves and 5.19 TCM conventional gas reserves. Argentina multi pad drilling market share is set to exceed USD 2 billion by 2024 on account of increasing investment in Vaca Murta Shale deposits in Patagoni. In 2017, BP, Total, Chevron, YPF and Dow are investing USD 5 billion to develop shale reserves. The country is also planning to offers a subsidized price of USD 7.50 per mbtu natural gas produced at new wells by 2020 which may further propel industry outlook. Companies operating in the multi pad drilling market include ExxonMobil, Devon Energy, Trinidad Drilling, Chevron, Nabors Ltd, Cairn India, Hess Corporation, Marathon Oil Corporation, Nostra terra Oil and Gas Company, Encana, Chesapeake Energy, Pioneer Natural Resources, Continental Resources, Earthstone Energy and Consol Energy. Industry has witnessed various merger and acquisition among companies to expand their global presence. For instance, in 2017, Exxon mobile announced to acquire company owned by Fort Worth’s Bass Family, to enhance Permian basin resource up to 6 boe by investing USD 6 billion. This acquisition will help company to expand its presence in the U.S.
Multi well is the practice of drilling several wellbores from a single location. The technology enables to drill from 2 to 16 wells on a single pad. It offers a huge advantage over conventional method as it leaves very less environmental footprints thereby being exempted from various government regulations. Its main advantage is to reduce the operation time while moving from one operating location to another as the rigs can be skidded or walked towards the next pad.